Purism, the company that has delivered free laptops, is now hoping to do the same for phones. As I write, the fundraising campaign is just over halfway to its goal, with 27 days to go. You might imagine that, with Purism’s past record, its efforts would be applauded, but instead, dozens of self-appointed pundits are explaining why its latest campaign is doomed to fail. Always possible, but unlikely. By the standards of Google or Red Hat, Purism is small, but, even so, I doubt it is attempting to raise 1.5 million without having thought through the idea from start to end. 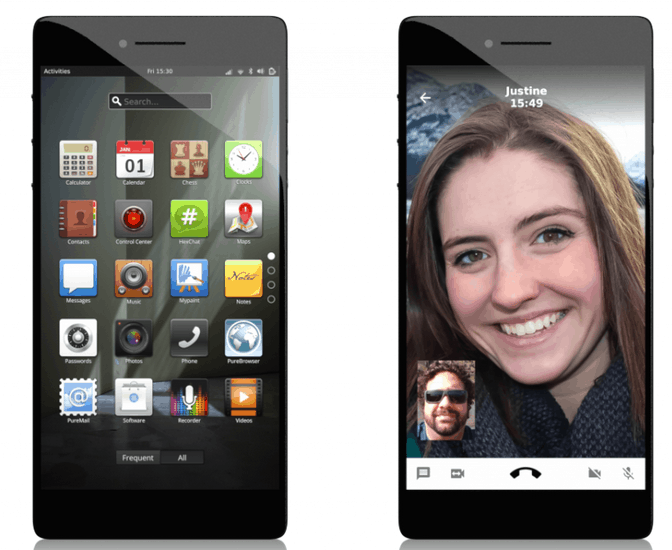 The fact that the Librem 5 (as the phone is called) is Purism’s fourth product suggests that the company knows more about what it is doing than the keyboard critics. No, not so far. However, it’s easy to be pure when you are in no danger of having to make practical decisions. Sometimes, without a compromise, a product may not be made at all. Admittedly, Purism’s previous products were not as free as they could have been when they were released. In particular, they did not use Coreboot, the free BIOS. However, for nine months now, they have. Nor is that the final stage. Uniquely among open hardware companies, Purism has a Freedom Roadmap, that lists all the steps it considers necessary for a totally free piece of hardware. Purism considers itself well along on that roadmap, but it has yet to win Respect Your Freedom Certification from the Free Software Foundation, or several steps beyond that. Both its progress and its publication of the roadmap make clear that the company is dedicated to eventually meeting its own high standards. True, but who said it was trying to? Like Purism’s previous products, the Librem 5 is a boutique product, designed for a minority to whom security features and the use of a Linux distribution are attractions. It is not a mass market product, although apparently Librem makes enough of a profit to employ a dozen people. While I am sure Purism would prefer to win a larger market, that goal is much further down the line. Demonstrating that open hardware can be profitable is at least as important a goal. That would be true only if it was doing exactly what other efforts did. However, Purism is expanding more slowly than Jolla did, and, unlike Jolla, is positioning itself in a niche market, at least for now. Similarly, it is trying to raise less than ten percent of Ubuntu Edge’s goal. In other words, it is not comparable to earlier efforts, so they are poor indicators of what will happen. If anything, Purism’s cautious expansion would seem to give the Librem 5 a greater chance of success than its predecessors. The choice of operating system alone does not determine how secure a device is. However, with free versions of Android lacking some of the proprietary features of other Android implementations, Linux should be easier to secure. Under the circumstances, using Android would be a contradiction of Purism’s goals for software freedom and security. Being the owner of a tablet that runs Ubuntu Touch, I have some sympathy for this view. One of the latest additions to the Ubuntu store is Zork 1, which, however welcome, still strikes me as less than innovative. However, Ubuntu Touch’s failure is not just a nearly empty store. The other half of its failure is its slowness to reach the goal of convergence — the use of the same interfaces and software on all types of devices. Technically, Ubuntu Touch will run standard Linux apps, but the process is far from user-friendly. By contrast, the Librem 5 should have access to the usual Linux repositories of packages. Some of these packages are not suitable for the small screen of a phone, but many are. Others, including GIMP, Inkscape, Krita, and LibreOffice have portable versions, or may be available online. There is every reason to think that the Librem 5 will be a phone that operates very much like a laptop or a workstation. The Librem 5’s tentative release date is January 2019 — sixteen months away as I write. This lapse is long enough that some have worried that, by the time it is released, it will be a mid-level phone at best. Considering that the Librem 5’s main features are security, that would not be a problem. However, those who worry about obsolescence need to read more thoroughly. If you scroll far enough down the crowdfunding page, Purism clearly states that “The specs will be finalized as late as efficiently possible to ensure the best available components. […] Specifications are subject to change.” In other words, what is being mentioned now are the minimal specs, not the final ones. At $599US, the Librem 5 is expensive compared to many phones from LG or Samsung. No doubt, if the phone had a larger market, it could be sold for less. However, considering that the latest Apple phones begin at $999US, the price is not unreasonable. Those who care about software freedom and security have proved willing to pay for Purism’s laptops, so every reason exists to think that the same audience will be willing to pay for the Librem 5. Of course, the Librem 5 may fail to reach its fundraising goals. It may also fail to turn a profit when eventually released. However, it is important to remember that most new hardware and software released by small vendors fail, not necessarily because of any mistakes, but because the near-monopolies of giant corporations make the odds for small vendors almost impossible. Still, explaining all the reasons why the device might fail in the marketplace is a defeatist position for those interested in open hardware to take, all the more so when few of the critics have any practical experience with developing a new product. At times, it sounds as though the critics are so used to seeing free hardware and software defeated that they take a gloomy satisfaction in predicting another failure. Having been involved in bringing a couple of products to market, I am all too aware of the difficulties that something as new as the Librem 5 faces. Purism’s caution and clarity of goals are reassuring, but, the only sensible position is to wait for whatever happens. The next sixteen months should make for some real-life drama, especially since, as a long-time free hardware and software advocate, I have an emotional investment in the Librem 5’s results. Okay, I’ll start the discussion with one of my patented “You know what I really hate?” openers. Why in Odin’s bug-ridden beard do we have to have just one ruling product? What is wrong with many companies, or individuals, working to create a better product or, for that matter, just a different product. Lots of people means lots of differing needs and desires. The idea that one company or product could somehow deliver the one product that does everything everyone wants is complete lunacy. There will never be a product that satisfies every need and every desire. Except for maybe the Holodeck. Products need to serve a purpose. They need to be at least as efficient, from a usage perspective, as their rivals, to justify their existence. Without taking any side, at a glance, what would be the added value of a new operating system or phone in the current market? Control over the device. I’m still using Nokia N900 because there’s no valid replacement available, and I started using it only after it became almost impossible to keep up with the world with just Openmoko Neo Freerunner. I think you meant to say something like ‘long-time free hardware and software advocate’, although I suppose under a liberal interpretation you are free hardware and software. What I want is a Linux pocket pc that makes calls, That runs real software not cartoon apps and has no need for a new App Store when you just apt-get what you need from existing repositories . A phone with easily accessible files and full control over them. Critics hardly make things – they sit and moan. Sometimes – as in this case – the fact that someone’s doing something radical is worth supporting. Which is why I support Librem 5. I also bought the Nokia N9 and the Jolla not because I’m a masochist but because I believe in helping those who try. I am not doing it for my self – to be an owner of a phone, I am doing it so that the folk in Purism will manifest a dream. Dear Purism – please carry on regardless. Both the N9 and Jolla are great phones and I hope that idiot who killed the N9 feels ashamed of himself!